Johnsonite Snap-In 'T' Molding and is made from high quality PVC, are extremely durable, and create the perfect, professional flooring finish for joining carpet to various flooring materials. Combined with your choice of track molding (purchased separately) can enhance any flooring transition. Hi, I would like to make a 45 degree turn. Do you have such an adapter? What do you recommend for transition between 1/2" tile (already installed) to 3/8" laminate (going to install). Longest run is 12'. Would prefer to not have seams. Can you provide samples? We just had thick carpet installed that abuts ceramic tile (straight edges). I'd like to add a transition molding that protects the carpet edge from fraying and getting dirty when cleaning the tile. 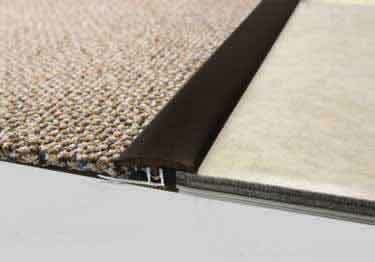 I think I see how to measure the metal track, but not sure how to pull up edge of carpet and tuck it back in tightly. Any suggestions? Is it possible to use this product for a transition with a radius less than 6'? And how have you determined what the minimum radius is (e.g. breakage at 6'?)? Also, let me know if/how I can send you a photo of the potential transition so that you can recommend the best color(s). Thank you for your question. If you scroll through the images in the right-hand image box, you can see the cross section for each one shown. The metal is 21/64" and the plastic is 11/32". If you need anything else, please let us know. I have recently had a flooring company install luxury plank vinyl flooring in my kitchen. There is a height difference at the transition to carpet (my family room). They have installed a wood transition piece that we keep tripping over or stubbing our toes because one side has an L edge. This product seems as tho it would be a better option. Please advise. Thank you. What type of adhesive should be used to secure a transition metal track to a concrete floor? We have track base already installed but would like to replace the existing vinyl adapter. How do I measure the existing track base "rail" to be sure that I order the correct adapter? Thank you. I have an approx. 3/3 square entry way. Do you cut this product for the corners, or can it be bought with corners? Will you cut to order? I need 32 1/4 and 31 7/8...Track and T-molding. I have an area in my house that is a transition from tile to tile that has a slight height discrepancy. I am not sure what to order. Do you have suggestions for what to do there? My phone number is 731-695-1980 or email is listed above so whatever is the easiest mode of contact for you. Thanks so much! Can this product be used to join vinyl laminate with vinyl laminate? Also, can we get color samples to match the floor as close as possible? Is the vinyl T-Moulding paintable? Can this system be reversed, where the track is embedded in thinset beneath the tile, i.e.,tile is meeting carpet or tile is simply being terminated at a doorway? Hi Lou, Thank you for your question. We do not recommend reversing the process. It could possible lead to tile cracking down the road. Thank you, The Koffler Team. I needed a T-molding to join two floors together in my basement. One is just a little bit higher than the other so the molding had to accommodate that. Also, the gap between the two floors is larger than most T-moldings. This Johnsonite Vinyl T-Molding did the job just perfectly. Because it is vinyl, it was flexible enough to accommodate a slight difference in height. Also, it was able to bridge the larger than normal gap between the two floors. It was easy to install as well. I highly recommend this! Thank you for your very thorough review, and the kind words about the ease of installation. Your personal experience and recommendation is greatly appreciated. I have used a lot of T-moldings over the years and this product met my expectations and fit the application really well. Other than, the eight foot piece of vinyl being folded in half for shipping purposes (it creased a little too much so the middle section was difficult to get the crease to settle back down and look flat), I liked the product and would order again. Thanks, Koffler! Thank you for your review and the the nice feedback about our product. We are sorry about the crease, however by folding it we have saved our customers a substantial amount of FeDEx oversize shipping charges. We do recognize the inconvenience of a crease and can ship it flat next time. Please request flat shipping in the special instructions of your next order. Also, customers say they have used a household hair dryer and the crease disappears pretty quickly. Thank you for your review. We have over 7200 different products, sizes and colors. We're so glad we had something to fit perfectly with your needs. Had a horrible installation of commercial carpet where seams were coming apart so we covered the seams and solved the problem color choices were key!! Thank you for your review. We are very please our T-Molding was a great solution for your horrible carpet installation. If you have any further questions always feel free to give us a call. We had Berber carpet next to tile. There was a chip in the tile and the carpet had run. This product secured the carpet and covered the chip in the tile edge. The end result looks good. We have only installed it recently so I cannot tell how it will holdup over time but I am pleased so far. Thank you for your review. We are very pleased that our product solved a critical issue with your tile / carpet transition. Always feel free to contact us if the need should arise. Awesome product will but again! Just what we needed. Going to order again. Needed to match up T molding that was damaged. This matched perfectly and was an exact fit. I bought this to fix my mistake and save A LOT of money. We normally use, I think, 1 1/2" T-molding. When I was putting that in, I got too close to a tile with my hammer and broke a chunk off, creating a sharp edge. I ordered this wider T-molding, it worked out great, looks good and we didn't need to get any tile work done, for now anyway. Was easy to order and arrived acceptably fast given the holiday period.